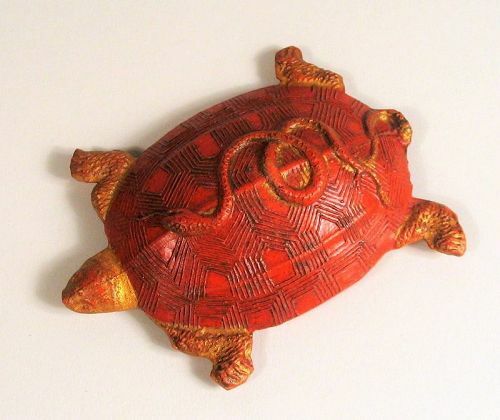 DESCRIPTION: A red and gilt ink cake in the form of a turtle with a curled snake on its back. 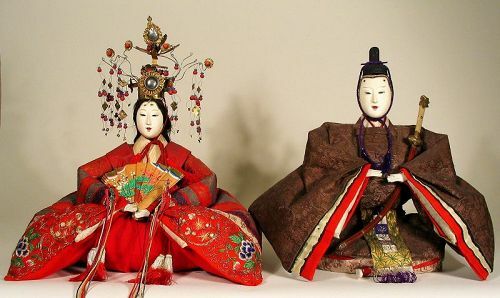 In ancient China, the tortoise and the snake were thought to be spiritual creatures symbolizing longevity. Both the front and back have been finely pressed in raised relief with gilt accents. One of the treasures of the Chinese scholar’s studio, this ink cake is in excellent condition, in its original box, and dates from the first quarter of the 20th C. or earlier. DIMENSIONS: 3” long (7.7 cm). 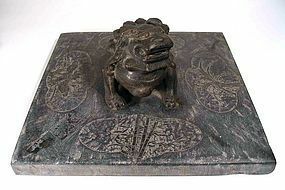 DESCRIPTION: A Chinese paper press (or weight), carved from one piece of dark stone with a lion on its haunches in its center. The lion bares its teeth and crouches with bold posture on a flat stone surface. Four cartouches featuring designs of bamboo, banana, peony, and blooming lotus are etched on this surface. 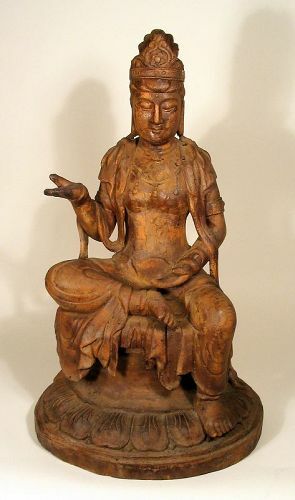 19th C., Qing dynasty and in good overall condition; small chip to lion’s curled mane in rear view. DIMENSIONS: 10 ½” square (26.7 cm sq.) 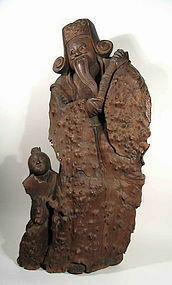 x 5” high (12.7 cm).